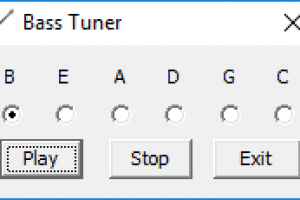 Generate notes as bass guitar"
This is a freeware guitar tuner that helps you with the manual tuning of your guitar and in mastering the musical notes. To move from an amateur guitarist, you need to be able to perfectly play all the musical notes and know how to tune the guitar to the specific key you want to play. All this requires constant practice and cannot be learned in one day. It is a simple and small utility. As expected, it does not take its toll on the system due to its small size. It won’t take up storage, RAM or affect the system performance. The application features a simple and minimalistic interface that provides you with a few configuration settings and options. This makes it easier for users to become familiar with the application within a short period of time. It allows you to choose from six different sound strings, which includes B, E, A, D, G and C. You can also play the selected sound string or stop it by clicking on the “Play” and “Stop” buttons respectively that are available on the main window. Apart from these, there are no other configuration settings. The application is designed for users that want to tune their guitar by generating six sound strings of the guitar. Bass Tuner is licensed as freeware for PC or laptop with Windows 32 bit and 64 bit operating system. It is in other audio tools category and is available to all software users as a free download.